The best to benchmark the Canon EF 24mm f/1.4 L II USM is to compare it with its excellent Nikon equivalent, the Nikon AF-S Nikkor 24mm f/1.4G ED. 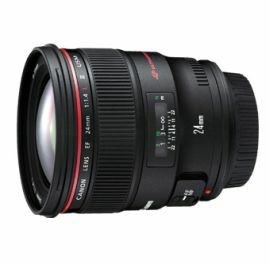 Vignetting really is the weak point of the Canon EF 24mm f/1.4 L II USM down to -3 EV at F/1.4. Both lenses keep the chromatic aberration really low, with a small advantage for the Canon lens. Overall, both these lenses are the very best for landscape photography with a Use Case score of 4.5 stars.